There is no sound with this video, so don't worry about your computer sound not working. I usually narrate this live when presenting this video. The video begins by showing you how to make the quilter's knot by wrapping a loop of thread around the point of the needle. Then the quilting process begins by popping the tiny knot into the batting layer. My needle enters the top layer only about 1/2" from where the line of stitching begins, and then the knot is popped through the threads of the fabric into the batting layer. Please watch carefully how the underneath finger and the thimbled finger work together to control the movement of the needle through the quilt layers. First, the needle is inserted into the quilt layers vertically, than transferred to the thimbled finger and rocked horizontally and back and forth forming the stitches several more times. The thumb of the hand above the quilt layers works with the underneath finger to 'bend' the fabric around the point of the needle for each stitch and before the needle is pushed through the fabric layers. This rocking of the needle allows a stitch to penetrate all 3 layers creating an even stitch on both the top and bottom sides of the quilt. This stitch is intended to hold all three layers together with small, even stitches. This process takes practice to perfect, the same as any other worthwhile endeavor. (Remember learning to play the piano? Practice, practice, practice makes perfect!) Do you have questions? Either ask them here, or refer to my book Winning Stitches. If you don't own a copy, you can get one for free with your purchase any item, even a $9 pattern, at regular price between now and New Year's Day from my website. It originally retailed for $28.95, so this is a BIG sale! I can't play it. :( It says "This video is private". I tried to change the privacy settings in YouTube. Try it again and let me know if it works or not. I can't find it on YouTube, either, but was able to play it myself. Got everything fixed, I think. If anyone has trouble playing the video, post a comment so that I will know. This was great, Elsie. Sometimes I have trouble with not catching the back, or the stitch on the back is smaller. Do you have a solution for that? 1. The quilt layers must not be too tight in the hoop. You may try loosening the layers slightly in your hoop. 2. The needle must be inserted perpendicular to the quilt layers. Then, as the needle is rocked, do not push it forward until the quilt layers are manipulated to be completely perpendicular to the horizontal needle before pushing the needle forward through the layers. 3. After the stitches are loaded on the needle and before you pull the needle through the layers, turn the hoop over and check the back. 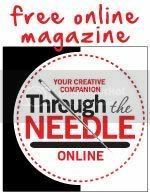 If you see even stitches on the needle on the underneath, pull the needle through the layers. If there are skipped places, or uneven stitches pull the needle out, and begin the rocking process again. You can teach yourself to make more even stitches by taking the time to check them on the back every little bit, until you get the idea. sorry but no sound.. do not know why. Nonnie, my first sentence under the video explains why there is no sound. It's not anything that your machine did, I just chose not to narrate this video because I use it as a teaching tool, and narrate it myself as I present it. I pretty much explain what I am doing in the text of this blog. Thanks for asking. Thank you for your comment on my blog. I have enjoyed seeing your beautiful quilts down through the years published in different works. And now looking at your Creations on your web site is quite inspirational. You do beautiful, lovely work. 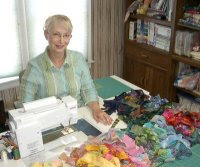 That's interesting that you grew up making quilts at Deer Creek Mennonite Church. I enjoy our monthly sewing circle at our Magnolia Mennonite Church now. It's one of the month's highlights for me. Julia, I've enjoyed your new book, especially your pattern for the cover quilt, which is quite similar to my Star Flower in the border of this blog. But six-pointed stars are harder to fit into a square or rectangular quilt. Yours is beautiful. Thanks so much for the video Elsie!! Most videos don't show enough actually quilting! This was great!! !